This last year I hit a breaking point. I knew where I wanted to go, but I just could not get there. No matter how I arranged my schedule, or ordered my project lists, I never seemed to make progress because I didn’t know where to start. I didn’t know which THING was the priority. I didn’t know which THING I needed to focus on first. I was overwhelmed by all the possibilities and paralyzed into inaction. I needed someone to walk me through “where am I now” and “where I want to be” and help me see the in between steps to getting to where I want to be. That’s a confusing way of saying – I needed someone to help me break down my project lists into next actions so I could move forward in freedom. So, I made a call to the best coach I know for things like this – my husband. He can listen to someone talk, break through the noise, zero in on what they are ACTUALLY saying, and help them sort out a prioritized to-do list like it’s his job. Oh, wait. It is his job. Well, one of the biggest reasons we get so overwhelmed as women, even though we know it’s unreasonable, is because we simply don’t know how to zero in on what actually needs to be done and then do it. Sometimes we get paralyzed into doing nothing. And this is when anxiety kicks in. When you think about it, it’s shocking to realize that the only thing holding many of us back from making changes in our lives is a lack of knowledge, or rather a lack of clarity. That’s why I’m so eager and excited about the 2019 Made to Give Life Seasonal Goal Planner. It’s created to help you get crystal clear on where you are now and help you make a plan to get to where you want to be. But even it’s not the end all be all. It’s good to be proactive in minimizing the impact of overwhelming circumstances by preventing them as much as possible. Hence, the beauty of the Made to Give Life Seasonal Goal Planner. But you also need to know how to process bigger things that simply won’t fit on a fancy sheet of 28-pound paper in your planner. He didn’t look at me. He looked right at the whiteboard with his marker at the ready and waited for me to start talking. As I talked he scribbled away on the whiteboard. Every now and then he’d erase something and move it into another spot, but as his pen squeaked, my anxiety began to slowly release pressure. What I saw on the board was all of my thoughts, plans, and hopes in a somewhat organized and a surprisingly logical fashion. Then, we just started talking through each of the points, making decisions on whether “this” or “that” is really something I wanted to do, needed to do, was called to do. We talked about what I was saying, “Yes,” to out of fear, and what I was saying, “No,” to out of fear. We crossed things off, and moved a few other things to other places on the board. And at the end of that time together, I understood what was going on in my brain, and I had three next actions I could take based on what came from that whiteboarding session. Now, when I get overwhelmed, start a new project, or just need to think freely without worry of wasting paper, I pull out my dry erase pen and eraser and start whiteboarding. If I get stuck, I ask him to come do the writing for me. We’re a team, and it’s a pretty cool thing. But even if he never obliged me again, he equipped me that day with the tools and resources I need to get unstuck, to get clear on what I should focus on, and to determine the next actions I can take to move forward. Whiteboarding is nothing more than a brainstorming session in front of a dry erase board. In our ever-increasing digital world, there is still a need for our resolute, not-going-out-without-a-fight analogue systems. Whiteboarding gets you off your phone, your computer, your screens, and onto a big wide open white space. And you brainstorm, brain dump, collaborate, think, and clear all the data from your mind, so you can see patterns, make plans, and get back to being productive and useful in your day-to-day to-do lists. Whiteboarding is highly visual, which engages a different part of your brain allowing you to think more creatively. Whiteboarding eliminates the space restraints of paper, which gives you greater freedom to get everything out of your brain. Whiteboarding makes it easier to write and erase, which allows you to work faster and keeps you from losing your train of thought. Whiteboarding allows for collaboration, which means you can brainstorm with others more freely. Whiteboarding encourages better brainstorming sessions because your brain knows it is not making an action list. Whiteboarding allows you to see all of your ideas in one spot in a more concrete way. Whiteboarding allows you stop thinking about the same things over and over again, which allows you to build on the shoulders of thoughts and ideas you’ve already written down. Whiteboarding eliminates redundant dialogue and clarifies what you actually believe and are trying to communicate. Whiteboarding helps you find patterns and themes in your thought process, which allows you to develop a project plan and determine clear next actions. Whiteboarding is used in business and education freely and prolifically. When my husband would talk about the meetings he would run at his day job, I would listen, but never think it would be applicable to me as a homemaker and work-at-home mom. I mean, I’m not exactly collaborating with corporate executives or teaching a room full of college students every day. 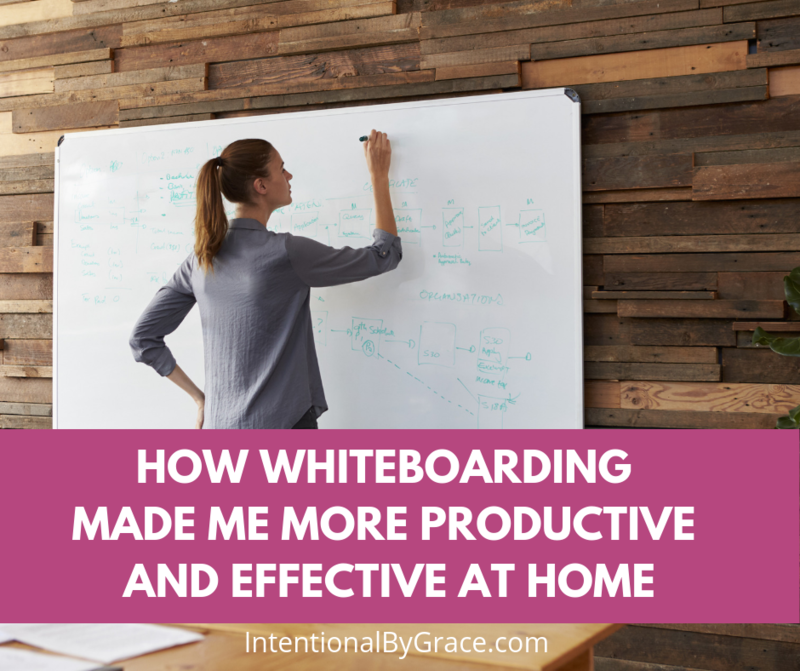 Just like it took me years to see the value in developing my own personal mission statement, I balked at the idea of whiteboarding because I’d never seen it utilized in the home. You certainly can’t do a search on Google or Pinterest and come up with any whiteboarding at home tutorials. Or at least I didn’t uncover any when I started wondering if I was the last to know about whiteboarding for greater productivity in the home. As women, we have a lot to manage from day-to-day whether we’re managing our school schedules, our children, our homes, our work, or our retirement. Every stage of womanhood requires us to be active and intentional about creating a life-giving culture wherever we go. We will give account to God for how we spend our time. I know this isn’t fun to think about necessarily, but it doesn’t negate the truth that we will one day have to answer for how we spent our time and how we treated others while here on earth. Personal productivity matters because it gets us out of the chaos, out of merely managing our time (personal management) and into the realm of personal leadership where we are free “to do all the good we can, in all the ways we can, as long as we ever can” (paraphrase from John Wesley). One of the ways we give life is by being efficient with our time and resources, so we can be more effective with people. So, we can GIVE LIFE. Whiteboarding is one of the many ways I use to be more effective at giving life with my words, actions, and attitudes. 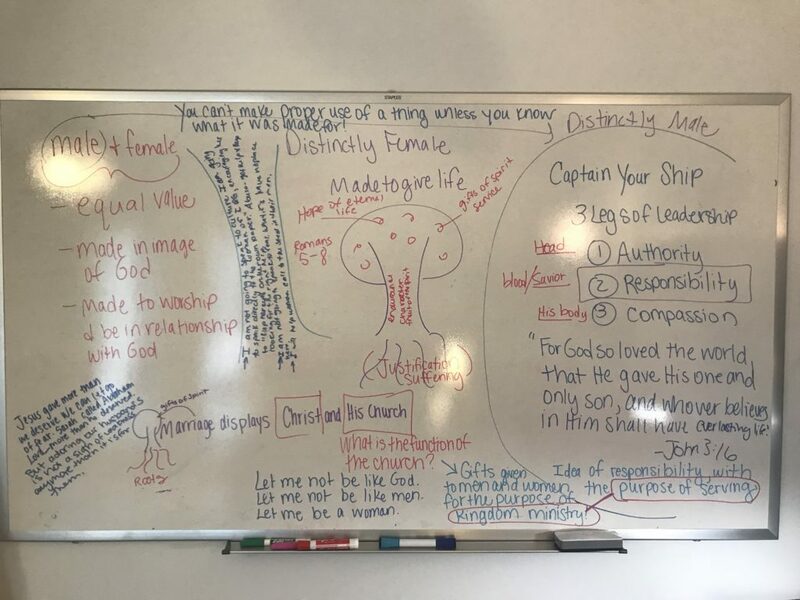 Last year I spent a lot of time whiteboarding manhood and womanhood. My friend, John Michael Clark, released an incredible course on biblical leadership in the home, and it set my wheels to spinning. If these things are uniquely male, then what is it that makes women uniquely female? I asked questions and answered them later when they came to me. I brought my husband into the conversation, and we talked about scripture and truth and what came out was the belief that as women, we are made to give life. That is uniquely feminine, and this isn’t just about giving birth. So, whiteboarding theological hangups and questions is a great use for whiteboarding at home! Work is an obvious choice for whiteboarding at home. You don’t have to be a corporate professional to take advantage of this! I tend to be overzealous in the amount of work I can get done. Therefore, before I enter a new month of work, I like to inventory how much time I will have to work versus how much work I have planned to do that month. You can see from the example above that I have more work than hours to do it in. delegate more tasks to my team. Whiteboarding this information is way easier than trying to do it on a piece of paper. I plan our homeschool schedule in 6-week cycles. I can’t plan a whole year at one time. It overwhelms me. But before I ever dive into the details, I like to get on the whiteboard and brainstorm my overall focus for the next 6-weeks. 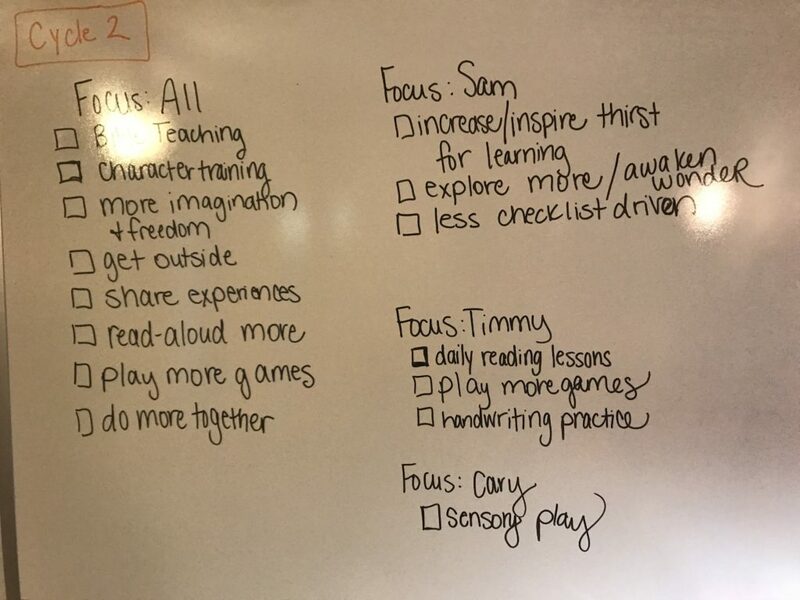 This is probably a prettier whiteboarding session than usually happens, but after I was done, I had a working list of “intentions” or things to focus on for each child in the next 6-week cycle. If I’m having a hard time divvying up a portion of our curriculum, I will set my board up like the above image. Then, just start working through the material until I have a better grip on what we need to cover that cycle. This is one that I collaborate with my husband on since it’s up to both of us to take care of our home and property. When we start saying the same things over and over, it’s time to whiteboard together. He almost always does the writing because he’s just flat out better at it (and I use the time to learn from him!). Then, he prioritized each list using our faithful numbering and lettering system (I teach this method in my eBook, Planning 101: How to Be More Intentional with Your Time). We stopped after the first list because we got interrupted, but we’ll come back to it soon. Choosing the right whiteboard for you comes down to what you need and the space you have available for mounting a whiteboard. We have five whiteboards (in various sizes) that we use on a regular basis in our home (3 of which are mounted). We would like to get at least one more large one for our office (to mount) as well as at least one more mobile whiteboard for monthly personal brainstorming. One thing you want to keep in mind that we didn’t think about before ordering our largest whiteboard is that you do want it to be magnetic. Our largest one is not magnetic and it’s really a bummer. 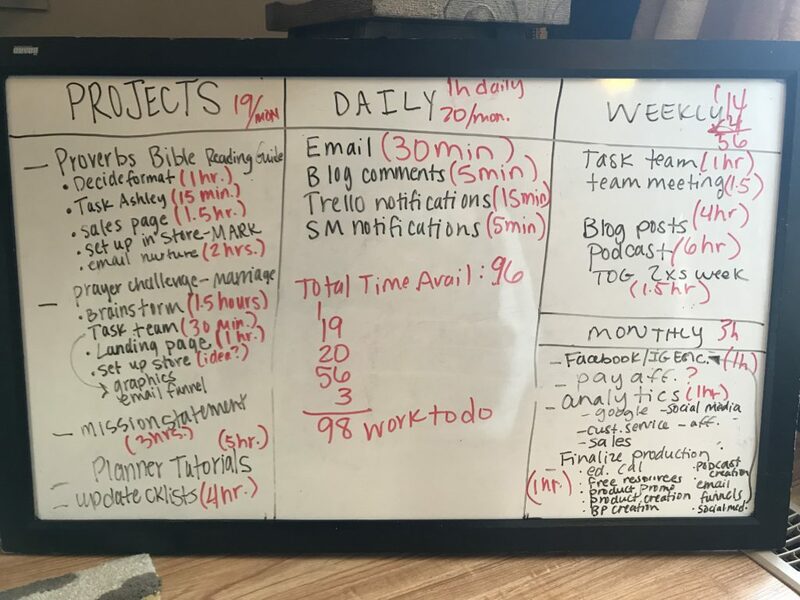 If you’re just getting started, a simple whiteboard like this one (17″ x 23″) is great. It’s great for quick whiteboarding sessions that I’m doing by myself. I generally don’t mount these size boards because they are so easy to slide behind a bookshelf, under the couch or bed, or even store in a closet. A step up from this would be a 36″ x 24″ whiteboard, which in my opinion is a better starting option. This size will give you a larger writing surface that fits on a normal sized wall while not being too large for normal home use. If you work from home, or really get into whiteboarding and have the wall space, then this size (60″ x 48″) whiteboard is our favorite. This is the size we use for whiteboarding home projects, homeschooling, business planning and strategy. But really, there are whiteboards in just about every size imaginable. Just make sure you choose one that’s magnetic. I really like the magnetic 2 colors in 1 dry erase markers. These magnetic dry erase markers are great too if you don’t like the larger markers. If magnetic doesn’t matter for you, then I really like these dry erase markers with the built in erasers. Dry Erase Liquid Cleaner is a true luxury. I used a wet rag and paper towel to clean my board for a while before my husband convinced me to just go buy some cleaner. It really does save time and energy, so I’m buying cleaner from now on. Even if your dry erase markers have built in erasers, it’s a good idea to have at least two large erasers on hand. I’ve covered this a little already, but let’s get more into the specifics. If you’re mounting your whiteboard, you want to put it where you will be able to stand easily. Ideally, you do not want to be leaning over bookshelves, maneuvering floor plants, or anything else. 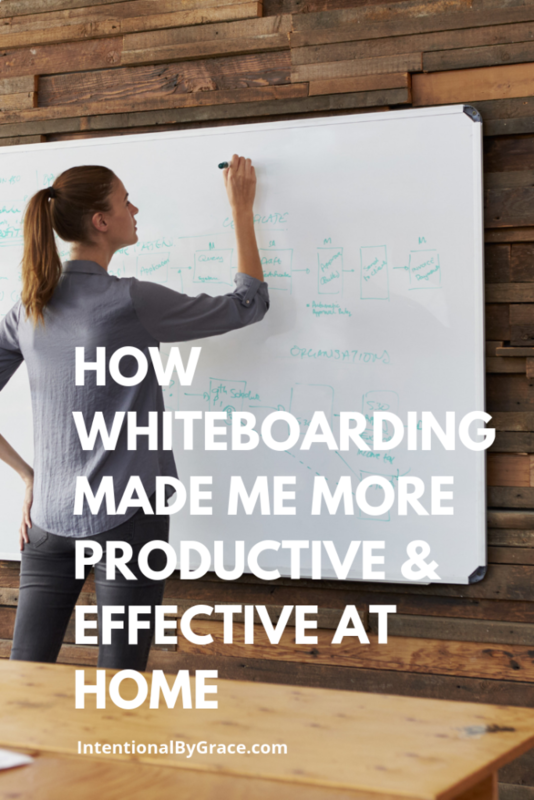 You want to be able to walk up to your whiteboard, stand normally, and start brainstorming. Of course, this means you need to have some wall space AND floor space in order to do it this way, but if all you have is the wall space, that’s okay. We have done it both ways in our home. If you don’t have wall space, you can still whiteboard. Just store your whiteboard behind a bookshelf or door. Then, just pull it out when you need it! As you whiteboard, be sure to stop and take pictures regularly. Think of it like saving a Word document on your computer. You never wait until the end to save, right? Once you’re done, you can delete any picture that you don’t need in order to save storage on your phone. 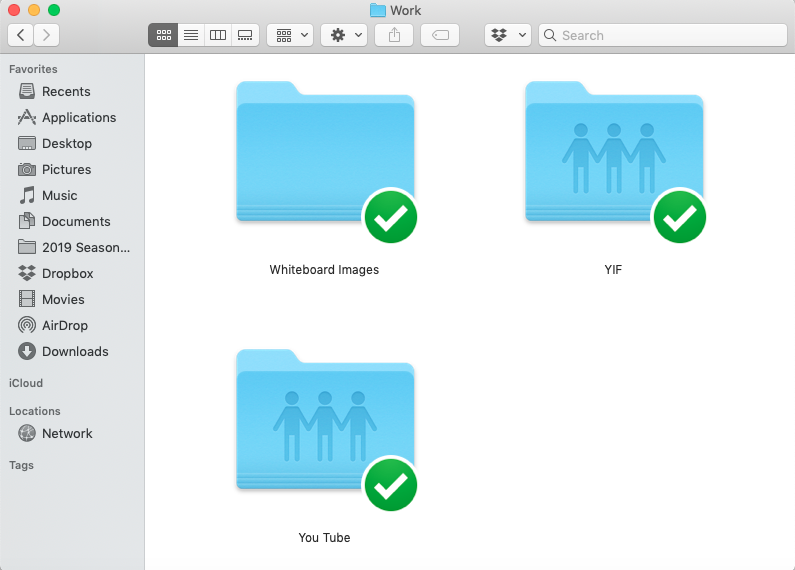 Then, save your whiteboard session images to your filing system. Personally, I have a folder called whiteboard in various folders on my computer. Then, I just save the images to the proper category’s folder. 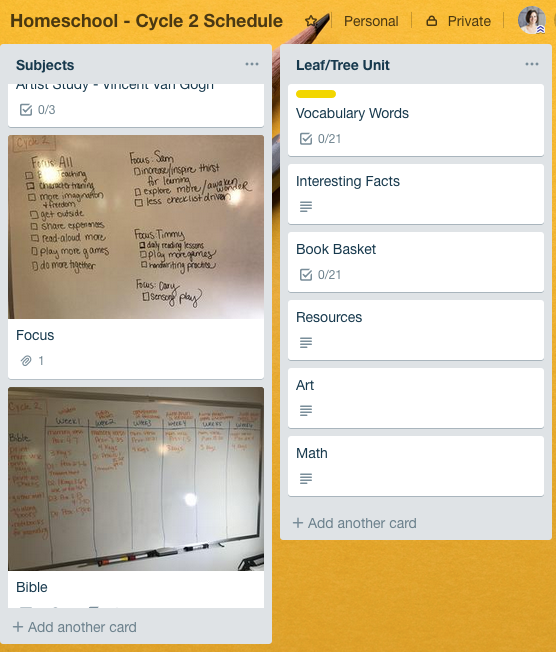 I also upload the images to the appropriate project cards on Trello. 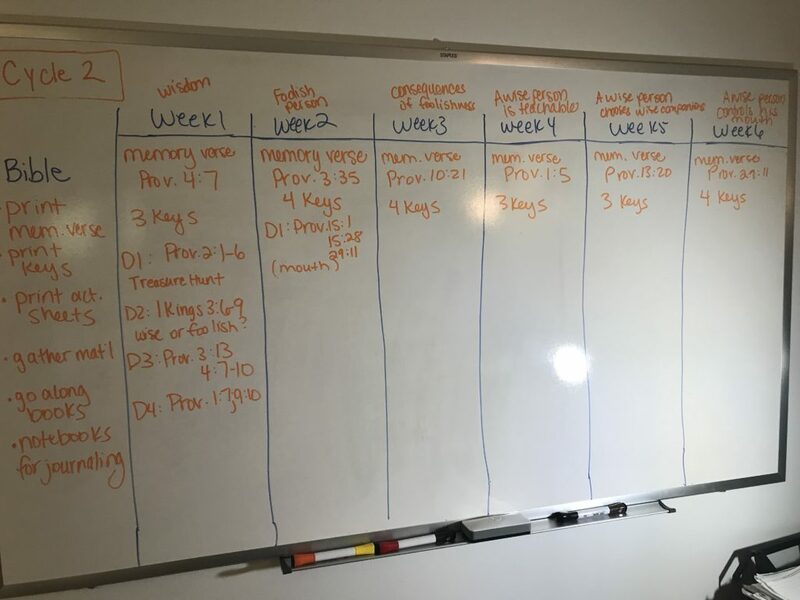 There isn’t a lot of information out there on whiteboarding at home, but that doesn’t mean we can’t read about how whiteboarding works in other spheres of work. What about you? 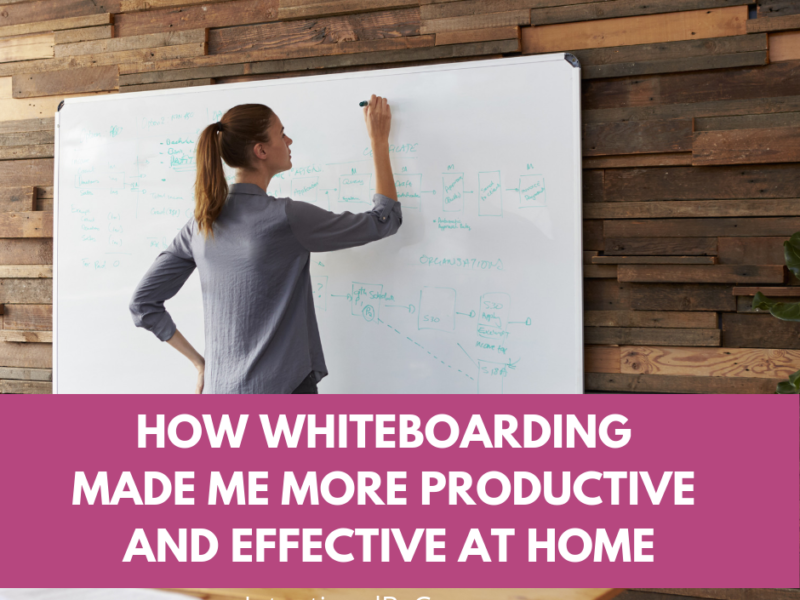 Have you ever considering whiteboarding at home as a way to increase productivity and effectiveness? I’d love to hear about it in the comments below! Fabulously motivating post. Going to read it again, and maybe print it out and highlight/ mark it up, get out my markers and white board and give it a go! And take photos along the way, of course. I am a very visual learner (art major), and this is right up my alley. Any other brainstorming, whiteboarding resources you can recommend? Wow, loooove this! Thanks so much! 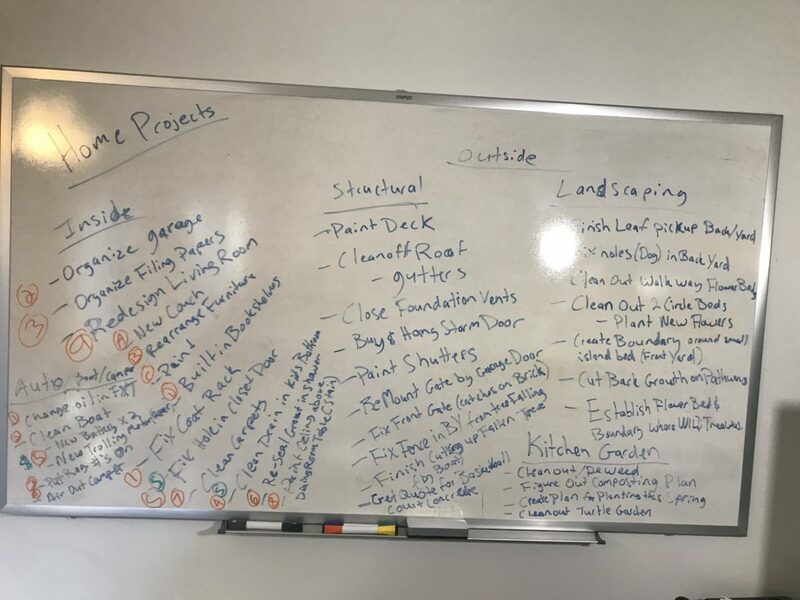 How many white boards do you have up or recommend? Wipebooks are sweet for this too. And can be at you fingertips anywhere. Anytime. 😋 My hubby bought us each one!